Look what I just got ! I couldn’t wait to get home and have a read. Oh I couldn’t resist !!! I was so excited that I only unpacked the refrigerated stuff from my shopping … the rest is waiting to be put away! I sat down with the magazine for a half hour of bliss. oh I must make that. the contents of a magazine on a blog. So … I’ll just show you a few things. How gorgeous are these teddy bears. The patterns for both are in the magazine. There’s also patterns and instructions to make these adorable mice. Never thought I’d be calling mice adorable ! And loads of other patterns for fairies, deocorations, wreaths, cards etc etc including this gingerbread couple and felt owls Sorry about the picture quality but it’s been a very wet and grey morning here in Ireland. There are also some lovely gift sections – all of which I want! Right I better stop now. Hope you enjoy it as much as I have. 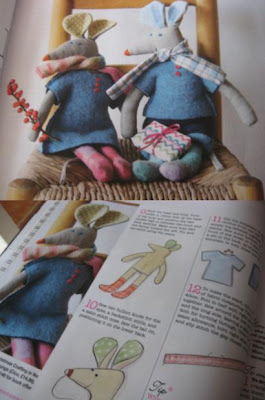 Don’t forget to enter the lovely giveway I’m hosting for the gorgeous book Freya & Fred. Click here to enter. Have a lovely day. I’m off to get ready for a dinner party. I’m hosting a Come Dine with me night – will tell you all about it tomorrow. Don't blame you being excited, looks really good. Have a lovely 'come dine with me, let us know you did. Stop! Stop! this is all to much for me! Just got back from our local shop, dont know if i can last the evening in wonderment! May have to return, incase everyone buys all the mags up and i will never get to see one! Ha! I had seen this mag advertised in another one and wondered whether it was going to be any good – that answers my question! Thanks! I had started to get christmassy and then weather changed to super hot and I just couldnt think about it! Still it's meant to be central heating weather again by the end of the week! Hmmm…. You just made me feel all Christmassy! All of these look gorgeous!!! I've bought this mag as well and there are some lovely things in it. oohh it looks scrummy and so do the mince pies. 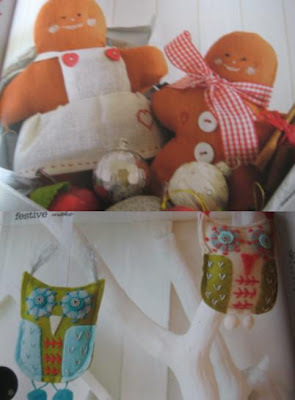 Helen Philips the creator of those ginger bread people has a gorgeous blog full of inspiration ! Love the Teddies, mice and the gingerbread. I was oooohhing and ahhhhhhing here.